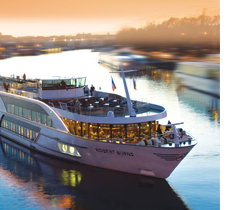 January 31, 2018 – February 20, 2018 - Riviera River Cruises has announced that Gloria Bohan, Founder, President, and CEO of Omega World Travel, will be the Godmother of their new ship, the MS Robert Burns. The christening ceremony, to be held in Vienna on April 3, 2018, will honor Bohan and her impact on the travel community. The MS Burns will then depart for a FAM cruise to Budapest. Bohan founded Omega World Travel in 1972 and has transformed it into the largest woman-owned company of its kind, with over $1 billion in vendor sales each year. Gloria Bohan fell in love with the travel industry during her honeymoon cruise on the QE2 and is the Godmother of Windstar Cruises’ Star Legend. Throughout her career, she has earned several other accolades, including induction into the Washington Business Hall of Fame, Executive Lifetime Achievement Award from Executive Women’s Forum, American Society of Travel Agents’ Travel Agent of the Year, one of the 25 Most Influential Leaders in the Travel Industry by Tour and Travel News, one of the Most Powerful Women in Washington by Washingtonian Magazine, and the Lifetime Achievement Award and Doctor of Law from Marymount Manhattan College. She serves as a board member for multiple organizations, including the World Affairs Council, and is a member of The Zenith Group and SmartCEO. Additionally, Bohan is active in various civic groups and sponsors Junior Achievement.